After more than four months, homebrew developer cools decided to update one of his more popular games called Block Dude. He just dropped by QJ.NET PSP Development forum and released version 2. Basically, this is somewhat a puzzle game as you have to figure out how to reach the door by moving various blocks hindering your path. According to cools, he tried to make this game as close as possible to the calc one created by Brandon Sterner. Block Dude v0.2 comes with all the original 11 levels and there are three extras from the flash remake. The developer added that a handful of custom made levels made by Access_Denied, Beefland, and Spirit Hawk have been included as well. Notes for this version: To every cloud, there is a silver lining. And while Zion won't be following up his Quest of Link demo homebrew game with a full version just yet, he brings us the next best thing - the gift of self...figuratively. Zion is letting everybody know that he's encoding the game into C format at the moment, and he is now releasing the Beta 1 demo of his game engine - sort of a teaser of his success porting the game's codes into the new (and hopefully more manageable) format. Notes for this version: As of now though, all you can basically do in this baby-phase Alpha release is control the Godzilla-sized Ash around the map you see in the pic above. You can also enter the houses, but they're pretty bare. Try it for yourself; no one's stopping you. The download doesn't contain a readme, so we can't quite direct you to any. Basically, the developer just wanted to get this early version out so that people could reply with their feedback. This game is a port of mariosokoban, and follows pretty much the same rules as traditional Japanese sokoban - the player's objective is to push boxes (or blocks) into a designated location within a maze; players are only allowed to move one box at a time. Notes for this version: * A new beautiful cursor is displayed in the editor mode * Oslib has been replaced by the Sdlmixer in the sound handler * Sounds can now be played in repeat/loop mode * 8 new characters ( bomberman , Kon of bleach, mini-bowser , sponge-bob, a new pokemon , picolo of DBZ ,shadow of sonic and shrek !) * 3 new levels * The joypad is now usable on the map and in the editor window * A new option "info save" has been added to display informations about saved datas * New dialog box when returning to the main menu, or while saving during the game. * New sprite for "teleportation" * New messages when a level is completed * Sounds are played during the game. * Bug fix in PSP CPU clock frequency settings * Bug fix with the donkeykong character (when entering in the statistics panel) * Home button has been disabled, to quit the game use the SELECT key (or RTrigger to return to the main menu). * Bug fix when you save while you play with you savedata. * Pikachu can now tranform! Well here it is, a SuperTux-Mod with Wario as the star. As you may know Wario is one of Mario's enemies, but this time things are different... Help Wario on this new quest!. NOTE: This is just a modification of the "SuperTux"-Game for the PSP. Notes for this version: As it's a mod, it hasn't really it's own version number. 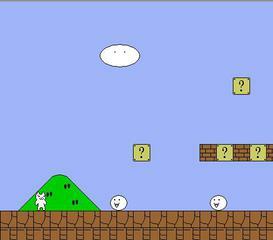 This is an improved version of the SDL version of Syobon Action (also known as Cat Mario or Neko Mario). The original website is at: http://www.geocities.jp/z_gundam_tanosii/home/Main.html (if you understand japanese). Notes for this version: * With lot of bug fixes. * Greatly increased speed in the game logic, and image processing. For fullspeed in PSP. * Text in english. The gameplay is similar to MOTAS or Crimson Room. 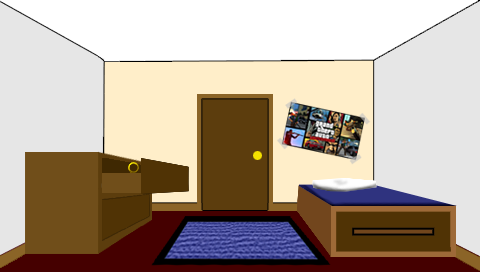 You have to collect items and figure out how to use them to continue on to the next room. Each level in the game will likely become progressively more difficult.